A comprehensive look at the current and future trends of restaurant operations, including financing options, commodity prices, redesign and marketing efforts. Plus, expert commentaries about mergers and acquisitions, local marketing and operations trends. 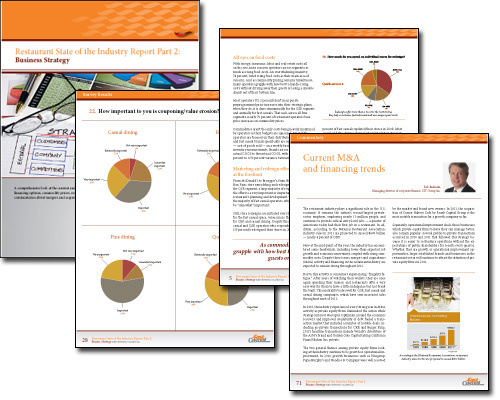 In this second part of our 2012 Restaurant State of the Industry Report, a benchmark survey designed to track food and beverage, operations, hiring and marketing trends across the restaurant industry, 203 professionals answered questions regarding their business strategy. The first report, which specifically focused on food and beverage, was released in May. It covered practices such as local sourcing, the breakfast daypart, catering platforms and menu item launches across the casual, fast casual and quick-service segments. Part 2, which also features the fine dining segment, takes a closer look at the specific tactics put into place by restaurant operators to help their businesses run successfully. It explores topics such as financing options, commodity prices, redesign and marketing efforts. Find out what your competitors are planning and hone your business strategy – download your copy today!